Long before his reinvention of the superhero genre with Batman Begins; long before he conjured The Prestige onto our screens; long before Inception even existed in a dream, Christopher Nolan was proving his worth as a director. Having garnered critical attention for his debut feature Following, Nolan sets its sights on his brother Jonathan's short story, Memento Mori. Eleven years on, it remains one of the most audacious thrillers in recent memory. Nolan's films have often been criticised for being cold or clinical, being too focussed on ideas or concepts to be interested in the characters. While this has been emphatically disproven with regard to his subsequent films, the opening 20 minutes of Memento are a little too mechanical. Some critics complained about the film's reverse chronology being little more than a gimmick, and certainly if all the colour sections had played literally in reverse, the film would have quickly become annoying. While such accusations are misplaced, this section of the film does seem more concerned with establishing a structure than with introducing a story. But once we are in the zone and understand how the film is going to work, Memento is never short of fascinating. Like many films associated with time travel or disparate memories, the big reveal happens in the middle (or so we think). But the film's deceptive chronology keeps pulling us in, forcing us to think if we want to keep up and rewarding our detective work. As in The Prestige, Nolan allows us to revisit scenes and places which we thought had run their course, and shows us that little bit more that makes all the difference. Telling the story of Memento in reverse is not simply a gimmick, designed to cover a deceptively simple story of revenge. Instead it challenges one of the deepest foundations of the thriller, namely the linear progression of suspense. In one sequence, when his wife is in bed re-reading a book, Leonard says: "I thought the real pleasure was in wanting to know what happens next." 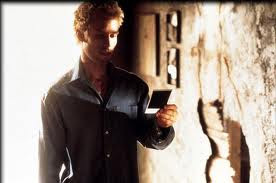 Memento completely inverts this idea, making us want to find out what happened before and allowing us to share in Leonard's disorientated state. On top of this emotional inversion, Memento twists the age-old principle of Chekhov's Gun. Chekhov's Gun states that no prop or device shall be introduced unless it is going to be used at some point: if there is a gun on stage in a play, it must be fired at some point, otherwise there is no point in it being there. In Memento, however, the question is not so much what each prop is for as to how it got on stage in the first place. If there is a Polaroid of someone or a name scribbled out, we want to find out how, when and why it got there. We (mostly) know what these props are for, but how they came about could make all the difference. 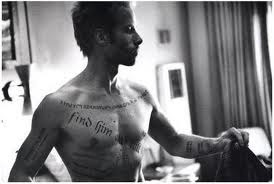 Memento is often cited by film theorists as a demonstration of the difference between plot and story. The distinction, put simply, is that the plot is a logical progression of events from A to B, while the story is what these events are ultimately about. In this case, the plot involves Leonard waking up in a motel, meeting various characters, and shooting Teddy. 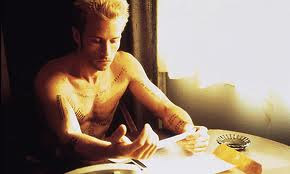 But it is the story of Memento, namely its exploration of memory and revenge, which is the thing which keeps us glued to the screen. 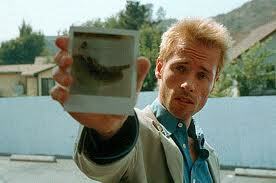 In approaching the subject of memory, Memento begins by making a distinction between factual and emotional memory. Leonard talks about learning by routine, relying on facts to determine his actions and tattooing them onto his body. Emotional memory, the memory of how an event or moment felt, takes a back seat to cold rationality. But as the film moves on it becomes clear that this distinction is at best ill-defined and at worst completely redundant. Leonard talks about memory being essentially impressionistic - the memory we have of an object or event is not an actual picture of it, but something we have created, changing anything from the colour of a car to the whole time and place when it happened. Even the photos on which Leonard relies are subject to manipulation and can be burned should his desires lead him to believe they are unessential. This, combined with the climactic twist and his recurring mention of 'instinct', raises the question of whether we really know or experience anything real. 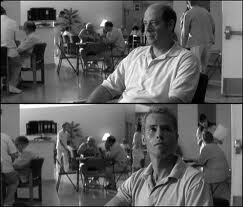 In terms of its character content, Memento could be called the acorn from which the mighty oak of Inception grew. Apart from their aesthetic similarities (both being expertly shot by Wally Pfister), both films have a central character whose actions are driven or dominated by the memories of his dead wife. Although Leonard's wife is a much gentler creature than Mal and has much less screen time, there is the same idea of creating new worlds from memories as a way of dealing with or attempting to escape reality (whatever that is). While Inception is more successful and adventurous in conveying this concept, all the groundwork for Cobb's dreamscapes is to be found in Leonard's decision-making. 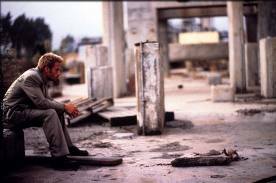 Memento is also further proof of the hardiness of film noir, showing just well how its techniques and archetypes have persisted and retained their relevance. Where previous neo-noir efforts like Blade Runner borrowed most from the genre's visual poetry, Nolan takes the convention of the unreliable narrator to its most extreme conclusion. Just as Deckard is increasingly unsure who may or may not be a replicant (or indeed, whether that really matters), so we find ourselves unravelling with the story until, in Teddy's words, "you can only remember the things you want to be true". This brings us on to the final scene in which the timelines merge and we are left utterly baffled by what we have seen. 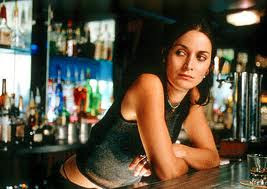 Teddy's line is the pivotal phrase in the film, capturing as it does both the film's message about memory and the motivations of the various characters. In Teddy's case, it is an indication of corruption, a desire to solve cases and create something certain even if the outcome isn't true: as he says, "there's plenty of 'John G's for us to find." For Leonard, however, the line reveals something darker. Having believed all along that Leonard was in the right, we are faced with the possibility that our tragic hero may in fact be a monster. Either his version of events is true, in which case his wife was murdered and Teddy gets what he deserves - or Leonard killed her, and is now wandering the earth killing people to fit with his twisted version of events. Most chillingly, Nolan leaves it to us to choose, handling his material with more subtly than American Psycho and leaving us genuinely unnerved. Memento is a truly great film with a twist and subtle touch which makes The Usual Suspects look like total child's play. Its intense examination of memory, morality and revenge is counterpointed by slick visuals and great performances, including a career-best turn from the eternally underrated Guy Pearce. It isn't quite a masterpiece, being neither as multi-stranded as Inception nor as mesmerising as Mulholland Drive. But whichever version of events you choose to believe, its greatness cannot be disputed.